Although coughs and sneezes are universally blamed for spreading the flu, surprisingly - exactly how, and how far, and for how long – the virus spreads in the air has long been the subject of debate. Influenza viruses are spread from person to person primarily through large-particle respiratory droplet transmission (e.g., when an infected person coughs or sneezes near a susceptible person). Transmission via large-particle droplets requires close contact between source and recipient persons, because droplets do not remain suspended in the air and generally travel only a short distance (less than or equal to 1 meter) through the air. Contact with respiratory-droplet contaminated surfaces is another possible source of transmission. Airborne transmission (via small-particle residue [less than or equal to 5µm] of evaporated droplets that might remain suspended in the air for long periods of time) also is thought to be possible, although data supporting airborne transmission are limited. Recommendations for infection control – particularly in health care settings – have generally focused on surgical masks to prevent large droplet transmission, and handwashing to stop fomite transmission of the virus. In recent years, however, we’ve seen research suggesting that aerosolized particles may play a much bigger role in the transmission of influenza than previously suspected. Last March, in With Influenza Virus Particles, Size Matters we looked at research from the University of Maryland that found Large droplets - long believed the the primary delivery vessel of influenza viruses - actually contained far fewer viral copies than did fine (≤5 µm) aerosol particles. This study not only found aerosolized transmission was probably more common than previously believed, they found that surgical masks, when worn by the person who is infected, do a credible job of protecting others from the virus. All of which serves as prelude to a new study, published yesterday in Nature Communications by a team of international researchers (including such familiar names as Malik Peiris, Benjamin J. Cowling, and Timothy M. Uyeki). We’ve got the abstract, and as an added bonus, an audio interview with Dr. Cowling courtesy of Radio Australia. Not only did these researchers find that roughly half of all influenza transmissions are caused by aerosols, they found that infections from smaller aerosol particles were more likely to make you sicker. First the link to the study (the bulk of which is behind a pay wall), and then a link to the Interview. 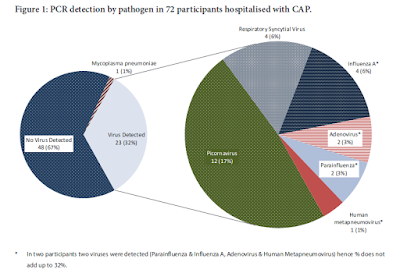 Influenza A viruses are believed to spread between humans through contact, large respiratory droplets and small particle droplet nuclei (aerosols), but the relative importance of each of these modes of transmission is unclear. Volunteer studies suggest that infections via aerosol transmission may have a higher risk of febrile illness. We find that aerosol transmission accounts for approximately half of all transmission events. This implies that measures to reduce transmission by contact or large droplets may not be sufficient to control influenza A virus transmission in households. The radio interview (click on the image or link) contains extended comments not in the transcription. Well worth the 4 minutes to listen to in its entirety. A team of international researchers say they've made an important discovery about the transmission of the flu virus. They believe their findings should prompt a change in the way Australians tackle the spread of the flu.